To day is a very sad day in our household. We lost a special friend and family member. 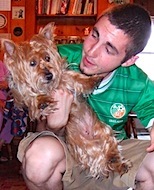 Our 15 year old Australian Terrier, Sheila (that is my son holding her in the picture), took her last trip to the vet today. She had been getting us ready for this for over a year now. She had diabetes for the last five years and her health has steadily deteriorated since then. Last year before Easter she became very sick and I was sure we’d lose her then but she recovered and gave us one more year. Though her eyesight and hearing were almost gone and she didn’t have much energy, she still liked to be held and have her back scratched. She no longer greeted us when we’d come home from work, but she seemed to know we were there. She couldn’t climb stairs but seemed content enough to eat and sleep and wander around the house or back yard bumping into things. She was always able to find her food and water and her bed when she needed them. There was nothing wrong with her nose. In spite of all her ailments it’s been hard to let her go. We hoped she would go on her own, but when her insulin supply ran out the decision was put into our hands. The drug company stopped making the type of insulin that we were using for her over a year ago and we bought up all that we could find before it became unavailable. Switching her over to another type could have caused her a lot of problems. We didn’t want to put her through that on top of everything else she suffers with so today we took her to the vet and were with her as she passed on calmly and peacefully. Good bye old friend. We got you as a pup when our kids were young and they grew up with you. You are a part of many happy memories that we have of those years. Now the kids are grown and gone from our home and we are very sad to have to say good bye to you. You added so much fun and unexpected entertainment to the mix of our lives. If I slept in too late you would barge into my room greeting me with happy barking and jump up on the bed to lick my face. You liked to play fetch with the tennis ball, but not outside. That was strictly an indoor game. Outside you would run around and play with the kids, the long fur around your face swept back by the breeze as you ran. You were cute and cuddly but no lap dog, always on the go, full of energy until your later years (but you never stopped being cute and cuddly). During the most depressing years of my life, when I was going though great difficulties, you were my companion on many late night walks that were full of prayers and tears and I shall never forget those times. Thank you for helping me get through them. Our late walks got to be such a habit that you wouldn’t go to bed until I did no matter how late I stayed up. You were there with me in case I needed a walk. Most nights I did, though sometimes I just felt like I needed to reward your patience. I especially remember the one glorious night just before Christmas when we happened to wander off our usual course for some reason and found one of the streets in our neighborhood lined for a long way with brightly lit luminaries. It was so beautiful, such a blessed experience that so easily could have been missed. As you got older our walks got slower, less frequent, and shorter until a walk to the corner was about all we could manage. Still, my walks won’t be the same without you. I don’t know if dogs go to heaven, but it sure seems like that is the place from which they are sent to us. They give us so much love and acceptance in return for so little in the way of basic care and feeding. It’s no wonder we become so attached to them that it hurts so much to let them go. There’s a short little prayer that says, “Lord, make me the kind of person that my dog thinks I am.” That says a lot. The things we learn from our dogs could make us much better people. In her younger years she was even a fabulous runway model. She always managed to be in the spirit of things, remember? Though the fashion industry is a high stress industry full of cat fights, she always kept her opinions about the clothes to herself and never lashed out at the young fashion designers. Yes, she was more fun to dress up than were dolls, wasn’t she? Sheila always loved Block Party Day. Not only did the kids get to play in the street, so did the dogs! And on just that one day, there were many plates of food left right on the ground, just for her. My friend Ginny once gave me a coffee mug for my birthday. It says “Welcome Each New Day.” That was just what Sheila did and encouraged us to do too! I’ll always thank Sheila for that lesson. I remember the greetings we got from Sheila whenever we came for a visit….the excitement in her barking voice let us know how how welcomed we were and how glad she was at seeing us…so full of love and excitement. Also at bed time I remember her willingness to share the futon in the back room with me and how she fluffed up the blankets around me and kept me warm by cuddling up to me. I remember how Shanna and Sheila liked their breakfast of eggs. I would like to think that when we arrive in Heaven, we will see Shanna and Sheila enjoying those eggs together. I truly will be missing you Sheila as I miss Shanna. I loved when you said her nose remained good – how we all smiled several years ago when I came to your house for a party and brought a cheesecake. We put it on a card table – yes, it was pretty close to the edge, but even still a challenge one would think for a pup so small to reach. BUT, we looked around to see Sheila standing straight and tall on her hind legs with her nose (and tongue) enjoying the cheescake. We were actually glad she found it – it showed us her nose still had plenty of life! God bless her and you too! Thanks, Paul,for sharing your thoughts on Sheila. It was always evident that you enjoyed her as a part of your household. It’s intriguing how dogs manifest the interface between the human and animal realms. Just wanted to drop a note and say that was a beautifully written remebrance. Sheila was an awesome robust little dog! I believe dogs like Sheila are angels here to remind us of our true potential to give and receive unconditional love.